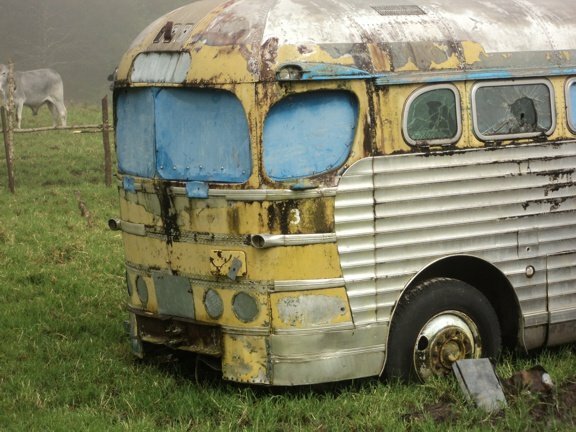 Discovered: Noriega’s Bus in the Jungle. In the late 1960’s and early 70’s the Volcan freedom fighters were taking on and beating the best of Manuel Noriega’s mountain troops. Noriega needed a base high in the guerrilla heartland north of the town of Volcan. Legend has it that he took an old Greyhound bus and had a helicopter carry it right into the heart of guerrilla territory. There his troops could at least have a dry and warm place to sleep as they fought against the insurgents. Ah! The stuff of legend which was not quite true. 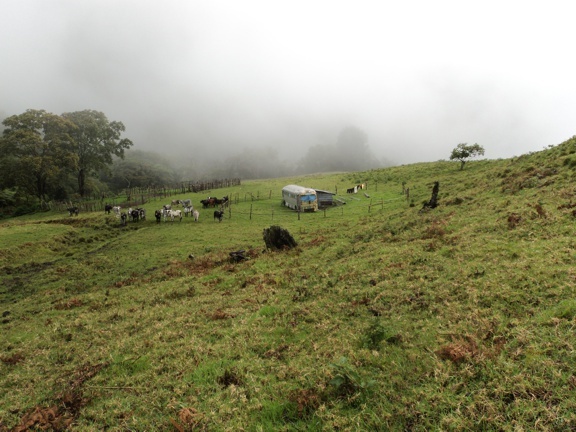 The journey from the Mount Totumas farmhouse is a 2-hour hike, up hill, through mud and you have to cross two fast flowing rivers. There are no bridges, you just have to “man up” and drive steadily through the raging water and hope you don’t stall halfway. The rivers were the least of our problems. A few minutes after crossing the second river we came across a huge fallen tree blocking the road. There was no way around it – we either went over it or we turned around and went home. With the rain slowly wetting my adventurous appetite and the muddy track making walking difficult, I admit I was ready to call it quits. Jason Ward however is of much younger and sterner stuff. “I can drive over these trees,” He stubbornly said. As I have recently discovered in 2017, the bus was owned by local farmer Chichilin Ponte. It was he who used a tractor to drag the bus up the mountain side and use it for a sleeping quarters for his workers. Yes, local police chief Manuel Antonio Noriega did later commission it for his troops. 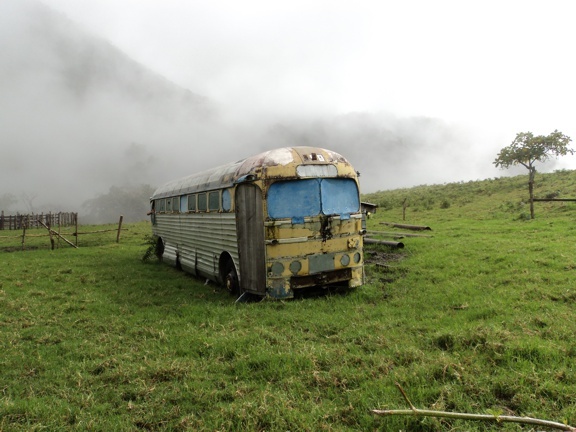 Tales of the mystical bus grew with each person that claimed to have seen it. The last person I spoke to said it was huge, double-decked and made of shiny aluminum. 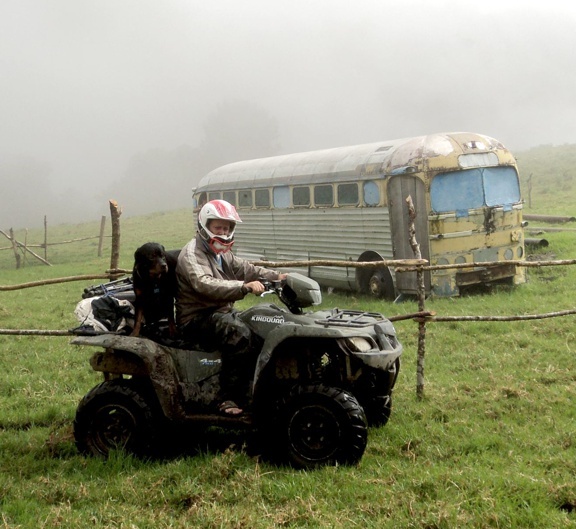 On Monday of this week I ventured high into the rain and mist covered mountains to try to find “the bus.” My guide on this trip was local tour operator Jason Ward. Jason and I are no strangers to these mountains. Our last adventure was in search of a serial killer – but that’s another story. 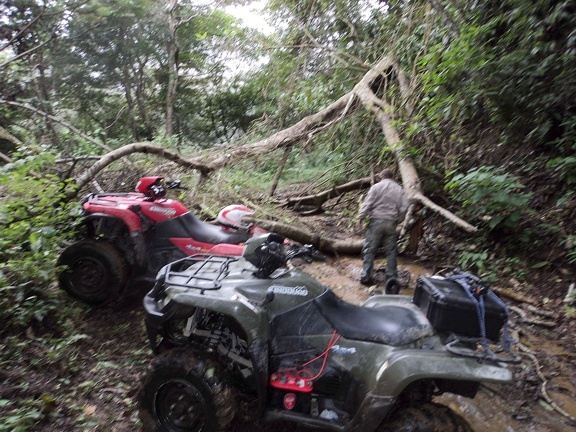 We piled small branches around the 2 foot high tree limbs and Jason repeatedly drove the smaller ATV at the offending trees. After half an hour of struggling and some muttering on Jason’s part, the ATV finally made it over. The second, much larger ATV, simply would not cooperate and we left it on the down side of the mountain and the two of us went onward on the remaining machine. By now the rain was coming down much harder. The altitude at close to 6,000 feet was anything but warm and tropical and I kept wondering how much more of these great adventures my aching 66-year old body could take. Then we came across yet another fallen tree. Not wishing to appear as the complete wimp I got off the ATV and dragged the tree off to the side of the track. Then God must have seen the suffering on our faces and allowed a brief spell of his glorious sunshine to break through the dark clouds. In my years writing about the history and mysteries of these mountains, too many adventurers headed out – never to be seen or heard of again. Please, always go with a competent guide. Just after midday with dark rain clouds hanging ominously over the Shangri-La Valley we headed north from Volcan to the area called Los Pozos. Here tourists and VISITORS alike can enjoy basking in naturally heated thermal pools. There are no entrance fees, no attendants you simply find the pools and immerse yourselves to you hearts delight. Careful, as some of these sulfurous pools are hot enough to boil a chicken. You leave the paved Rio Sereno road at the sign for Tierras Altas and then descend along a rough rocky road to the base of Mount Totumas. At a small farmhouse (site of the chicken boiling pool) you head northeast on a lesser kept road. Fortunately Jason had given me good instructions on how to drive a quad four wheeler. Always keep both hands on the handlebars, don’t over accelerate, and lean into the turns. The quad bikes are amazing. Not only are they automatic, have 4x4 drive but when things get really hairy (and they did) you have the luxury of a differential lock. As Jason pointed out, this almost gives you the traction of a tank. Spirits lifted we drove the remaining uphill path to the alpine meadow location of the mystery bus. The road, if I can dignify it with that name was little more than a rocky riverbed that only fools, horses and ATV’s should ever try. 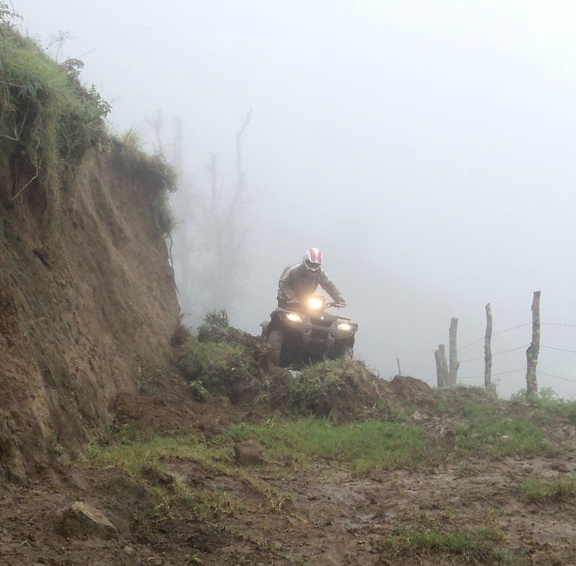 Then, after clearing a small hill - there it was – Noriega’s Silver bus. The site of this World War 2 era vehicle was a bit unearthly. With the mountain mists swirling around and the odd shaft of sunlight highlighting the scene – it was, to put it mildly – a little bit spooky. It stood alone in a clear alpine meadow, surrounded by cows and a rustic wooden fence. An Indian squatter family now calls it home. The engine was gone but the wheels were still on it. Then the truth dawned on me. On the front was a huge steel tow bar– the kind you see on railway carriages. I doubt if a helicopter moved this 12 ton bus as logic dictates they would have first removed the wheels. Kicking, screaming, bumping and grinding, Falsely, legend had it that Noriega had the bus dragged here. Yes it was dragged here, by an equally complaining bulldozer. 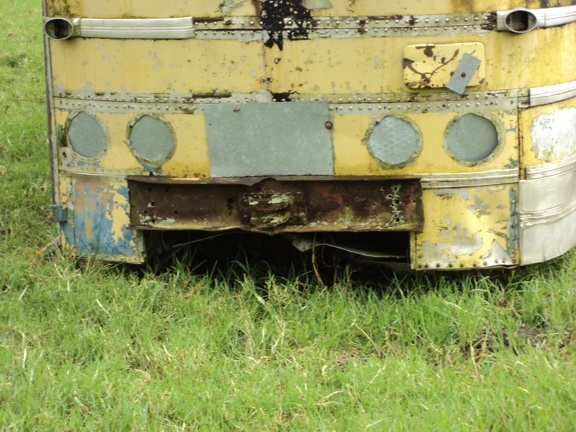 The bus has sat abandoned since the end of the mountain insurgency. The police however, 2 years ago, raided the bus because local criminals were using it as an “Ali Baba’s” cave to store their stolen goods. If you have Google Earth on your computer you can see this prime example of 1948, Greyhound Silverside, 6 cylinder, diesel-engined public transportation at 8 degrees 52’ 33 north and 82 degrees 40’ 43 west.